Because sometimes kale is just a little too much, these Crispy-Baked Cauliflower Bites are the perfect paleo alternative to kale chips. I have a confession. I don’t actually know how to make crispy kale chips. There is a recipe somewhere in the recesses of the early days of this blog, but, truthfully, it needs work. And I haven’t mustered the patience to tackle it again. My crispy kale chips are more of a soggy mess. But, oh, the flavors are so enticing. Keep the seasonings and switch the vegetable. First, broccoli came to mind, but I nixed it because broccoli, although possibly my favorite vegetable ever, felt a little too complicated. Then I thought, what about cauliflower? 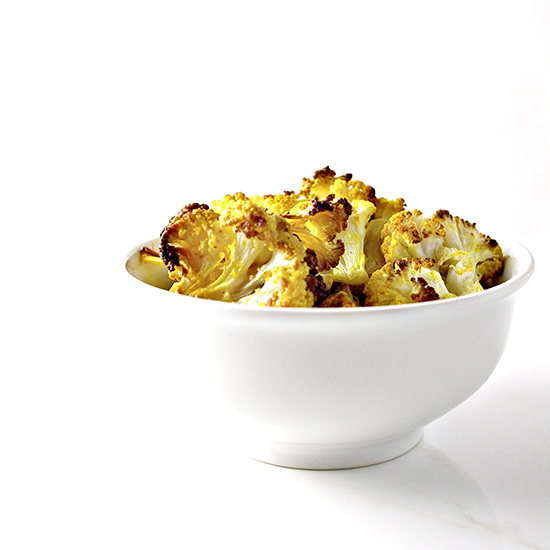 After all, cauliflower is that laid-back friend who gets along with everyone. As for what to call this recipe, well, that became a challenge. I went so far as to peruse a thesaurus, looking for words other than “chips” or “bites.” Dead. On. The. Floor. Crispy-Baked Cauliflower Pieces, Crispy-Baked Cauliflower Allotment, Crispy-Baked Cauliflower Allowance, Crispy-Baked Cauliflower Chunks. Crispy-Baked Cauliflower Allotment has a certain ring to it. Maybe we should go with that. “Here’s your allotment,” and mean it literally. I stuck with “bites” and, so, Crispy-Baked Cauliflower Bites were born. However, every great recipe needs an alias. This time “allotment” won. For the crispiest of crispy allotments, plan to be in this for the long haul. Err on the side of less coconut oil and more baking time. 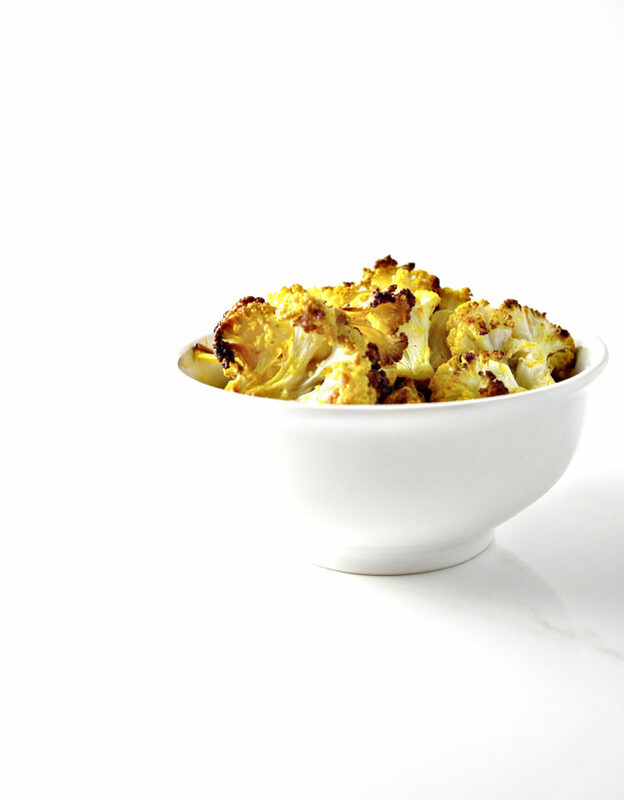 To create the bites, break the cauliflower head into florets and then slice each floret into halves. For some of the larger pieces, slice them into thirds or even fourths. Add the bites to a large bowl, add the coconut oil and seasonings, and then stir with a sturdy spoon. It may be tempting at this point to add more coconut oil to make stirring and coating even easier. Resist temptation. Walk away from the coconut oil. Put it in the trunk of your car if you must. But, whatever you do, do not go overboard on the coconut oil. Yes, coconut oil has the power to take every finicky vegetable (I’m looking at you, kale) and turn it into a misunderstood soul, deserving of back pay on the love. But, too much oil will leave your cauliflower chips soggy. We will not do this to ourselves. Just keep stirring, even when it seems all has been lost. Keep. Stirring. After you have stirred the bites, spread them out on a baking sheet lined with parchment and bake for 55 minutes, turning them over once about halfway through. Let me make a second confession. I don’t go overboard on the flipping. Some pieces are little or hard to reach. I leave them alone. To give each little bite a fighting chance at delicious flavor, I turn the baking sheet around so those in the front then move to the back. This makes me feel better about not being more thorough in my flipping duties. If I were to start a food blog today, the words “lazy” and “chef” would have to be in the title. Chef Lazy right here. I still refuse to break a sweat over food. Once you hit the 55-minute mark, you have a few choices. Eat them as they are, or take out the pieces that have crisped and continue baking the remaining pieces until they’re done. I have a third confession – I love the burned pieces, a trait I inherited from Mom. Think burned hot dogs, burned kale chips, and burned cauliflower bites. Seriously, if I could roast all of them over an open fire, I’d be a happy camper. However, if your palate is a little less into that, watch carefully if you decide to bake longer. These Crispy-Baked Cauliflower Bites go from underdone to overdone in what feels like a matter of seconds. If, like me, you strive with every fiber of your being to live in harmony with vegetables, try this recipe. It really is next-level vegetable action. The robust flavor hides the responsible, possibly boring, nature of vegetables. Find a couch on which to sit or a sink by which to stand and get chowing. These are just waiting to be made. Break cauliflower into florets and slice florets into halves (or thirds, depending on size). Melt coconut oil in a small dish and add the turmeric, garlic salt, onion salt, and sea salt. Stir until blended. 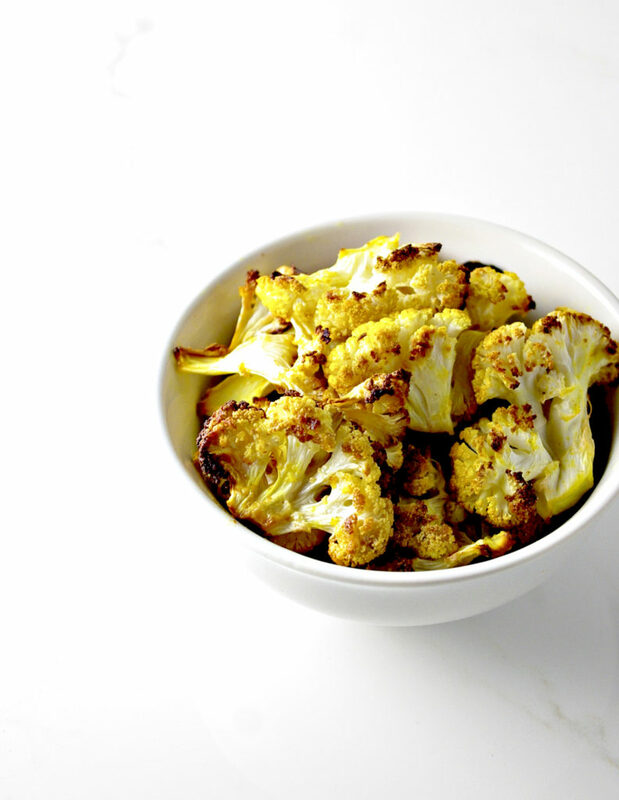 Pour coconut oil mixture over cauliflower pieces and stir until evenly coated. Bake on a baking sheet lined with parchment paper for approximately 55 minutes at 395 degrees. Turn pieces over one time during baking. If some pieces still hold excess moisture after 55 minutes, bake a few minutes more, keeping a close eye on them to prevent burning. I do highly suggest using a flat baking sheet to make these. I first made them using a 9 x 13 cake pan, and they didn’t bake evenly. Some were burned, others were still soggy. The baking sheet lined with parchment has worked the best for me.